Dr Peter Enns is an American biblical scholar and theologian. Here he tells the Bible story of Zacchaeus and how he was saved. I notice how different this gospel message of salvation is from the gospel Paul preached. Muslims would go with Jesus on this. Christians would follow Paul’s gospel. Ironic. ‹ Is Loving God Sufficient to Make Someone a Believer? 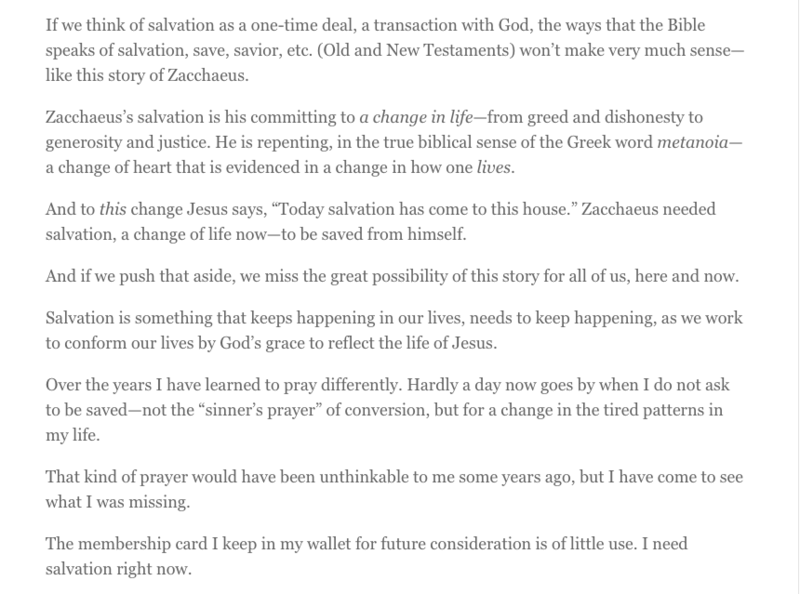 I agree with the call to repentance but this writer is not careful enough with his context and exegesis. 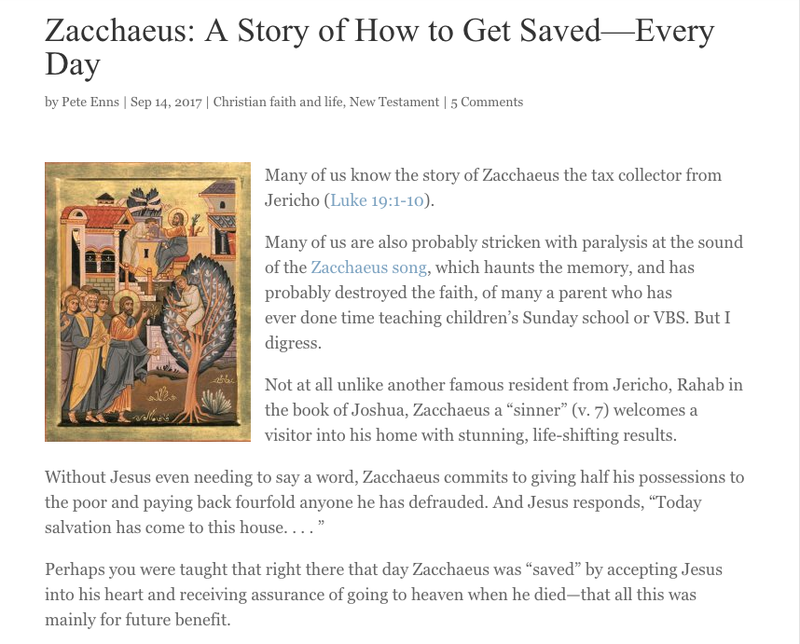 > Without Jesus even needing to say a word, Zacchaeus commits to giving half his possessions to the poor and paying back fourfold anyone he has defrauded. Not exactly. Jesus has just been speaking about the rich giving up their possessions to follow him. Luk 18:19 “Why do you call me good?” Jesus answered. “No one is good—except God alone. Luk 18:21 “All these I have kept since I was a boy,” he said. Luk 18:23 When he heard this, he became very sad, because he was a man of great wealth. Luk 18:24 Jesus looked at him and said, “How hard it is for the rich to enter the kingdom of God! This is the immediate context and It seems that Zacchaeus knows and is responding to Jesus’ message. > Zacchaeus’s salvation is his committing to a change in life – from greed and dishonesty to generosity and justice. He is repenting. Zacchaeus is the example what is “impossible with men”. He is rich yet leaves it all. His action is not just to be generous and just but to follow Jesus to Jerusalem and be part of his mission that Jesus is bringing. To know what this mission is continue reading the gospel. You guys just don’t get (or don’t want to get it). Zacchaeus was already following Jesus, and was already saved. There was no need for any add-on salvation. In other words, there was no need for Jesus’ alleged “blood” atonement. The priority is for religion of Paul not for the religion of Jesus. “Ayyy… I can, just like Zacchaeus, get saved without that whole messy human sacrifice, God dying and the innocent being punished instead of the wicked baggage. The sacrifice of Jesus can still be a condition of forgiveness even before the event actually occurs. In the mind of God it was a fact that is certain even though it was a future event before it actually happened in time. All events are foreordained before they occur anyway. Talk about squaring the circle. your god had thoughts of pouring all sins from all years on jesus continuously , why did he even reveal the ritualistic book of leviticus? all that ritualism and nitty gritty only to have it replaced by pouring all sins on a pagan man god? this same god also knew how he would punish in the depths of hell and since no human had any resources to get out of divine punishment like pagan man god did, then he knew humans would get it worse than jesus.